FIFA World Cup 2018 is just around the corner which will be taking place in Russia in June-July 2018. The winners of 2018 tournament will get that trademark shinning gold “FIFA World Cup Trophy” on 15th July and we take a look at history of World Cup trophy since the inception of Football World Cup back in 1930. The current “FIFA World Cup Trophy” was introduced in 1974 World Cup and since than its been used by FIFA awarding it to winners of World Cups from 1974 to 2018. Until a team wins the world cup three times since 1974, the trophy will be kept by FIFA and only replica is given out to winners. Current trophy is widely regarded as the most iconic trophies in Sports today. Made of: The current trophy is made of 18-carat gold with the base made of malachite. The height of the trophy is 36.8 centimetres while it weighs at 6.1 kilogram. Designed By: New world cup trophy was made by Stabilimento Artistico Bertoni company in Italy and it features two humanly figures kind of holding the earth. At the bottom of the trophy FIFA engrave names of each of the winning teams since 1974. So far Germany, Argentina, Italy and Brazil has won this trophy twice since 1974 and if any of the the teams win it three teams they get to keep the real one forever. 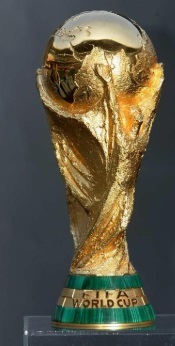 Well unlike the current iconic gold “FIFA World Cup Trophy” the winners of very first World Cup back in 1930 were awarded what was known as “Victory” but renamed in 1946 to “jules rimet trophy” in honor of FIFA president Jules Rimet (who helped established the tournament in first place back in 1929). It was designed by “Abel Lafleur” and gold plated sterling silver was used on white/yellow marble base. It was around 35 centimetres in height and 3.8kg in weight. A figure representing Greek goddess of victory was the prominent feature of the trophy. Uruguay won the 1930 World Cup and became the first team to win this trophy. jules rimet trophy was awarded to winners of World Cup from 1930 to 1970. According to 1930 rules winners of the world cup will hand back to trophy to FIFA until a team wins it three times who than can keep the real trophy in perpetuity which happened in 1970 when Brazil won their third World Cup. Now jules rimet trophy is on the display at the Brazil FA headquarters in Rio de Janeiro.